If you see a cougar: Do Not Run. Do not surprise the cougar. Make noise to ensure that the cougar is aware of your presence. A cougar is not likely to attack a person unless it feels trapped, provoked or you appear to be prey (which is why you should not run). If you are in a group, gather everyone together if possible and move as a group. Respect the cougar’s space and do not approach it. If the cougar sees you, stand your ground, look as large as possible by standing up straight and putting your arms up in the air and slowly back away. If possible, go inside a building or get into a vehicle. If a cougar makes contact with you, always try to fight it off. Throw rocks, use sticks. Do Not Play Dead. Cougars, also known as mountain lions or pumas, have a tan or tawny coat, with white or cream-colored chin, undersides, and inside of legs. The ears are rounded, and the back of the ears are solid black to dark gray. The tail is long (up to half the total body length), thick, and tipped with black. Cougars less than a year old have dark brown spots. Cougars less than a year old have spots. 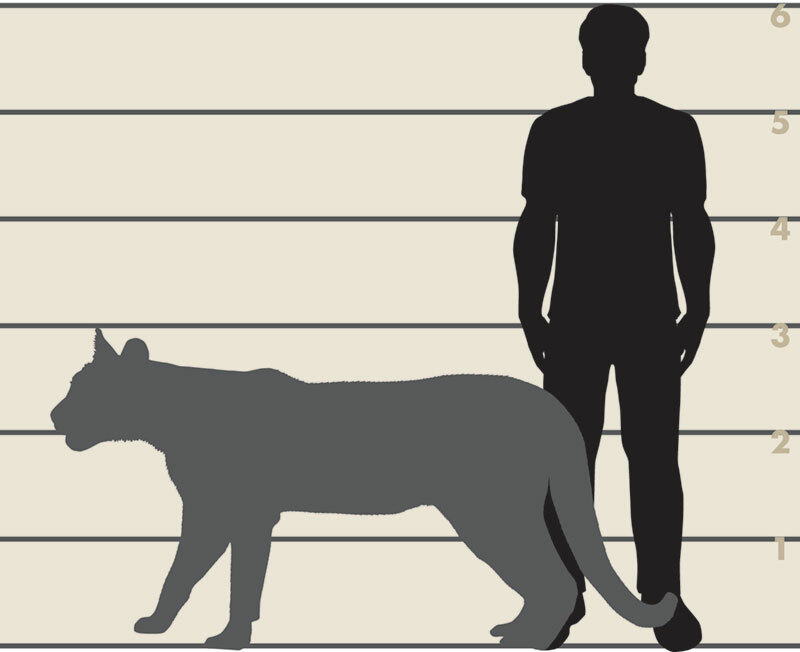 Cougars are substantially larger than other cat species found in Illinois. The man in the diagram below is six feet tall. Cougars are typically very elusive, so most sightings last only a few seconds. 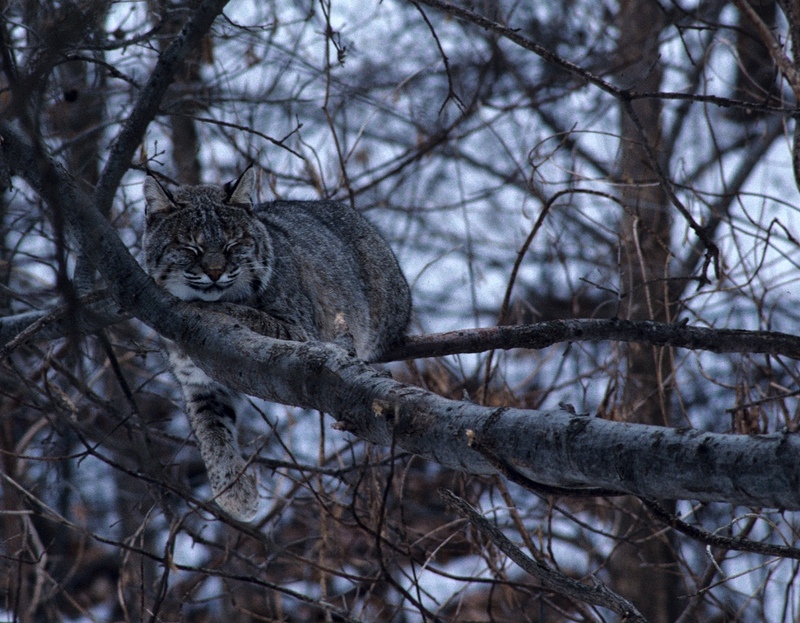 In Illinois, domestic dogs, domestic cats, and bobcats (Lynx rufus) are the animals most commonly misidentified as cougars. 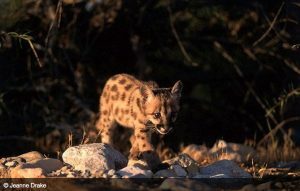 Bobcats are sometimes mistaken for cougars, but bobcats are much smaller, have spots and short tails. In addition to their large size, there are several distinguishing features of cougars that can help in positively identifying them. 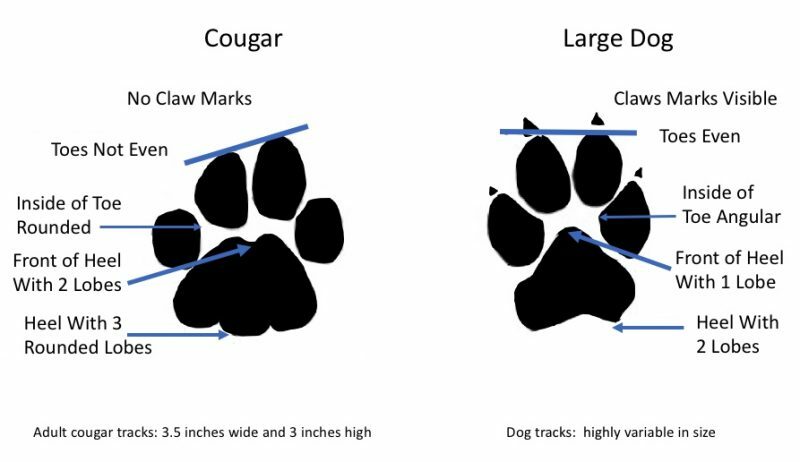 The chart below highlights the differences between the species most commonly mistaken for cougars. 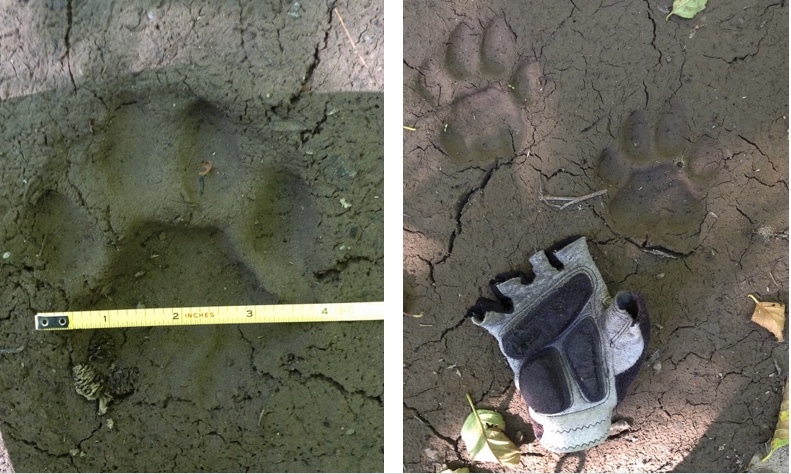 Four cougar carcasses have been confirmed in Illinois between 2002 and 2019. A cougar was killed by a train in Randolph County in 2002. Another was killed by a bow hunter in Mercer County in 2004. A third male was shot and killed in the Roscoe Village neighborhood in Chicago in April 2008. The fourth was killed by Illinois Conservation Police at a farmstead in Whiteside County. All were sub-adult (2-3 year old) males. DNA analysis indicates these four animals were genetically similar to cougars from South Dakota and strongly suggests that these are all wild males dispersing from that western population. Images taken by trail cameras in Jo Daviess County (September 2012) and in Morgan, Pike and Calhoun County (October and November 2012) were confirmed by IDNR to be a live cougar. Given the long distances typically traveled by cougars, and the proximity of the counties (especially Calhoun, Morgan and Pike), it is possible that the camera images may have shown the same individual. Similarly, trail camera images taken from Sangamon and Effingham counties in November 2014 were confirmed to be of a cougar. The distances and chronology of the images suggest that they may have been of the same animal. Cougars were eliminated from Illinois before 1870 due to habitat loss and hunting pressure. In the last several years there have been confirmed sightings of individual cougars moving through the state. There is no evidence that resident breeding populations of cougars exist in Illinois at this time. 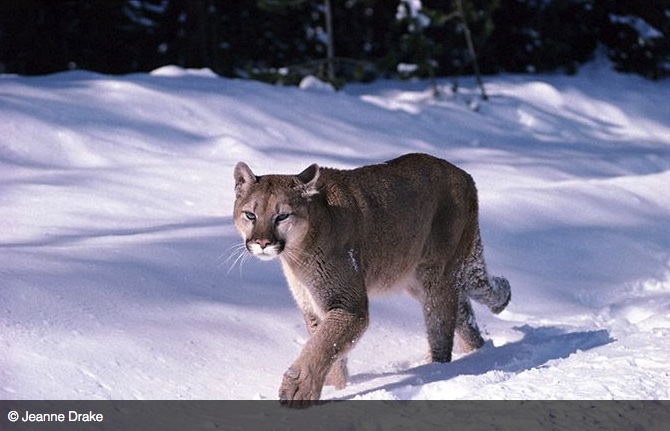 As populations in South Dakota, Nebraska and Rocky Mountain states increase, it is possible that cougars will disperse through Illinois in search of new territories. Cougars have been protected in Illinois since 2015. Cougars may not be hunted, killed or harassed unless there is an imminent threat to person or property. If you feel that your person or property is being threatened, contact the Illinois Department of Natural Resources (IDNR) to learn about options available to address potential threats. The IDNR may issue a nuisance animal permit and assist you with control measures. If you have recently seen a cougar in Illinois, please report the sighting to the Illinois Department of Natural Resources.